Now, scientists at the National Institute of Standards and Technology (NIST) and the Maryland State Police Forensic Sciences Division have developed a protocol for measuring those levels and used their new protocol at three forensic chemistry labs. Their findings were published in Forensic Chemistry. "If I run a sample and it has fentanyl, I want to be sure that fentanyl came from the sample and not from background levels in my lab," said NIST research chemist Ed Sisco, the lead author of the study. 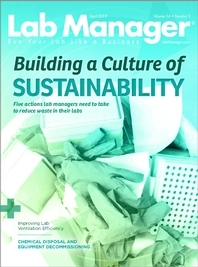 To measure those levels, the authors swabbed laboratory surfaces in the same way that airport security agents might swab a passenger's hands or luggage. At the airport, that swab would go into an instrument that tests for traces of explosive residue. In this study, the authors tested the swabs for traces of narcotics. They swabbed laboratory benches, balances, telephones and door handles. They also swabbed outside the lab space, in evidence-receiving areas and office spaces. To ensure that the measurements reflected routine conditions at the lab, no unscheduled cleaning took place prior to testing. "If you push your sensitivity enough, you'll find narcotics on almost everything," and not just in chemistry labs, according to NIST research chemist and co-author Marcela Najarro. The authors cited a 2011 study that found detectable amounts of cocaine on 75 percent of shopping carts, ATM machines and other frequently touched surfaces in public places. At the labs they tested, the researchers detected at least 13 different substances, including fentanyl, heroin, cocaine, oxycodone and methamphetamine. For fentanyl, the average level detected was two nanograms, or billionths of a gram, per square centimeter, and the highest level was 55 nanograms per square centimeter. "That level of background wouldn't affect measurements at most labs because most labs don't look down that far when testing evidence," said co-author Amber Burns, a forensic chemist with the Maryland State Police. "But knowing those numbers can be important if a lab is considering an increase in their sensitivity." In the meantime, they hope their research will provide a reliable protocol that any lab can follow. "You can't completely eliminate background levels of drugs," Sisco said. "But you can measure it to make sure it's low enough, and that it stays low."